SOLD L'Afrique Divisee suivant l'estndue des ses principales parties . . Title: L'Afrique Divisee suivant l'estndue des ses principales parties . 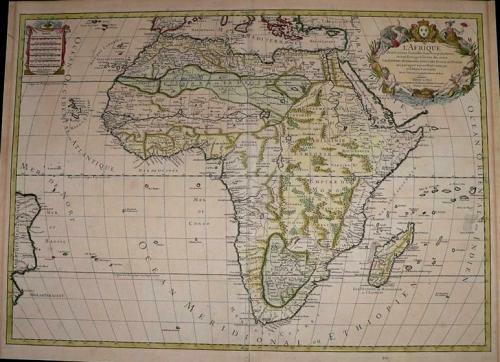 . .
A large map of Africa, published by Hubert Jaillot, that provides a highly detailed picture of the continent, based upon the geographical compilations and work of Nicolas Sanson. Jaillot conceived in 1674 of the re-issue of Sanson's major work in an enlarged format. The maps were issued as early as 1674 and were later jointly issued by Sanson and Mortier in Amsterdam. In good condition, with an old about 10 cm repair on the back, hardly visable in the front. 2 map sheets -the rest of the folding is just papertaped to flatten it.